Why say anything? This is my EPIC 25,000 Twitter Follower Giveaway. I could ramble on, and cry or something--but you're awesome, let's party! Wow!! Angela you are THE best!! Congrats on the followers!! And thanks so much for doing these amazing giveaways for your fans and followers! Thanks for all the well wishes guys! I appreciate every one of you. Someone asked how to join the site--it's the right hand column encase anyone else is looking for it. It's almost even with the giveaway widget when I look at it but it's probably not on other sized devices. Sorry! I don't want to pressure you or anything, but I AM reading Pigments of My Imagination. Bribery works. Just saying. Speaking of the book, which I'm reading slooooooowly because I'm busy as hell this week, I just want to give William a giant hug because of...y'know. Awesome Accomplishment! 20% into Pigments of My Imagination right now! CONGRATULATIONS! And whoever win this contest is so lucky. (I hope, it was me). Thanks for the AWESOME PRIZE!!! Congratulations on reaching 25000! Let's keep going higher and higher! Congrats on reaching that many followers and thanks for the giveaway! Can't wait to read your books. Congratulations on the milestone number! Very cool. I have since updated my blog, now to follow it you can find the button at the very top of the page. Congrats!!! This is a great thing for any author! Press Press Press!! And thank you for the great giveaway chance! Congrats!!! And what an awesome way to celebrate it! What an awesome milestone! 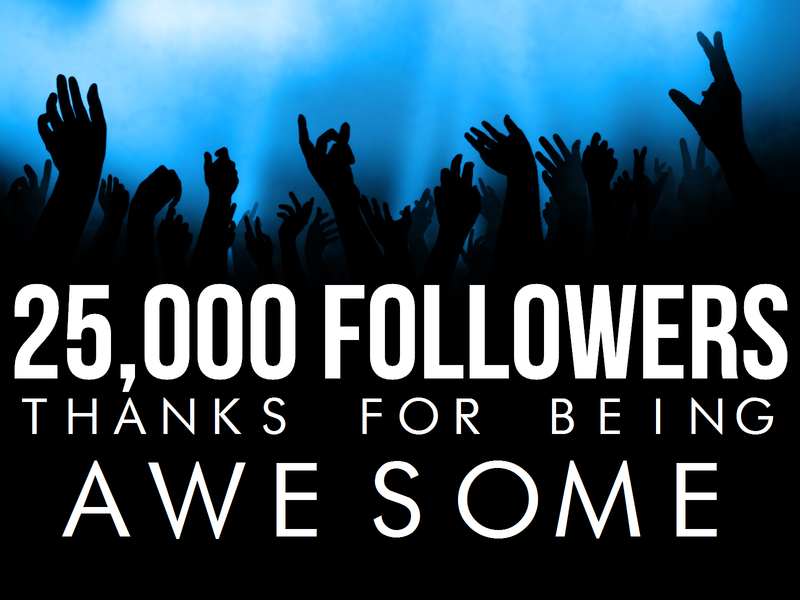 Cheers to the next 25,000 followers! Wow! Congrats on the milestone! 25,000 Twitter Giveaway is OVER, did you win? September is BOOK BOYFRIEND MONTH! Vote for SNAPSHOTS in Cover Wars!